Greetings from central Lingee, in Southern Sikkim. Today was my first day at my homestay here. Safe to say, I have reached nirvana and am in a state of absolute bliss. Himalayan mountain-scape, living breathing and pulsing rainforest, and a family that DOESN’T SPEAK ENGLISH!!!! Wawhoo!!! I’ve been frustrated since arriving in India at how many people speak English, making my acquisition of Hindi fluency truly impossible. 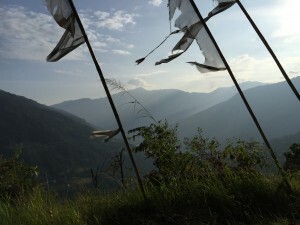 I already know more in Lepcha, one local dialect, than I had learned in three weeks in Jaipur. Let me just jump into what I did today. 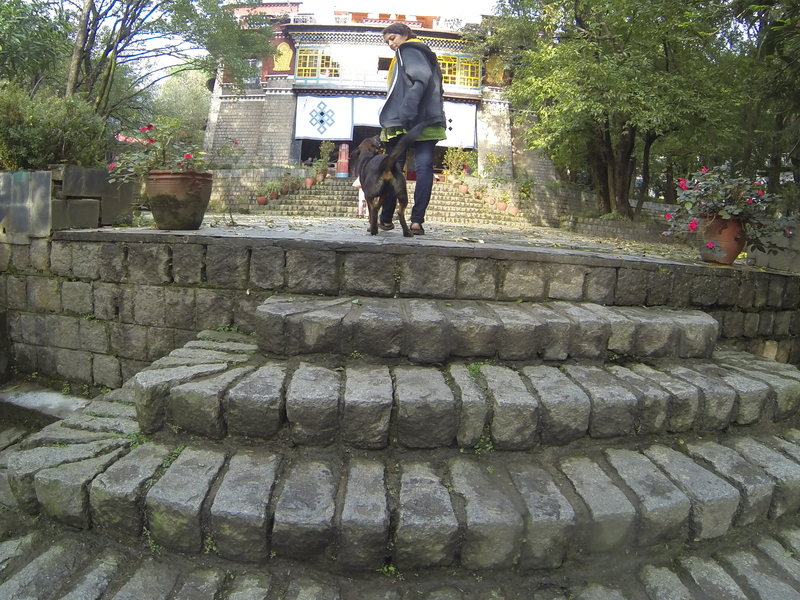 I woke up around 530 and went for a jog (a mountain ascent tour more like) with Neemchang around 6. Neemchang is my host brother. He goes to university in Gangtok and is studying to be a physical education teacher. He’s about 22 years old. We stopped at the Russian Orthodox Church and on the way down, stopped at Elfanz’s house, where my coordinators eventually gathered. Elfanz’s family made me chai, which was followed by different sizes and flavors of guava (based on the various trees each fruit was picked from), cardamom, a tomato from a tomato tree (yes tomato trees do exist and yes the ‘matos are better than your finest heirloom). Elfanz’s sister in law was singing and dancing with the many flowers in front of the house. Neemchang went to the kitchen as I sat with Elfanz and the other advisors, going through a book about Sikkim and talking about Lepcha. We returned from Alfanz’s house around 10 and I was fed a huge bowl of the most delicious rice, dal, and vegetables I have ever had (440% certified organic). Then I helped Phudoma peel the skin off huge buk veggies. Phudoma is the Bonthing’s daughter (My project is on the shamanic practices of Lepcha mun and bonthing). Phudoma is 23 years old and just graduated university studying political science. Buk is a tuber that I later found out tastes like starchy buttery organic matter. Nothing better. Good thing I had so much energy, because we went to the sacred cave after. This cave is up up up up the mountain. 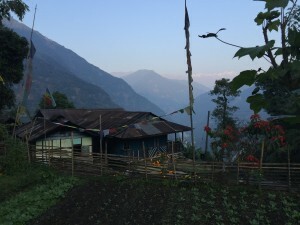 I learned from Neemchang and Phudoma that the paved roads on which many taxis fly to and from Gantok (the capitol of Sikkim) and other big villages were just put into Lingee three years ago. Before this everyone walked everywhere. 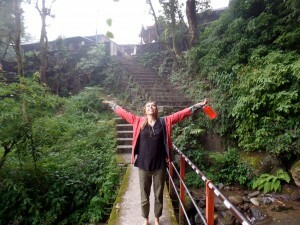 Up and down steep stairs to school, to your families’ house, to Gangtok (which is about a 3 hour drive). We saw an oxen plow being put onto oxen and a field being tilled, we passed a very old monastery that was locked and had been damaged in an earthquake. We eventually got to the cave. We came upon what was titled “doorway”, which is said to lead to the mouth of a cave in West or North Sikkim, but in the earthquake the passage way was blocked. We walked clockwise around an ancient stone monument with Tibetan script carved into stone, before continueing to the actual enterance that is used by people today. We shimmied between two huge rock faces using a root for balance, as if the root was created as a rope for cave worshipers. We got to a hole covered by metal gate type thing which Neemchane removed and explained you must have a bright light and when you climb down the ladder you must shimmy along the ground until you get to a huge open area. There is a stilagtite that stops those with negative energy from going further. We didn’t go inside because we had no light. 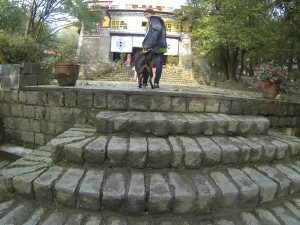 We began walking down the stairs to the paved road which we continued to walk down. We passed many people, some called Rye people, who are of a different caste than Lepcha. We passed some Rye people building a protestant church. Neemchange emphasized on multiple occasions that the Christians accept the Christian Doctrine blindly without understanding of the roots of Christianity. I saw a photograph of a bridge made from a few shoots of bamboo river a rushing river in Elphanz’s book, and Elphanz told me that bridge was within an hours walk. I asked Neemchang and Phudoma if we could go to the bridge, and despite the fact we had already been hiking for about 2 hours, they were happy to adventure further. Our journey took us off road and onto a jungle path, a trail that wraps around the mountain. Along the way we passed people carrying baskets of grasses, firewood, cardemon, strapped to their foreheads and resting on their backs. This trail is the only way to reach a village situated on an adjacent mountain. If people from that village want to come to market they must walk half a day, across the bamboo bridge and on this trail to reach Lingee, the small town in which I am staying. As we walked we laughed and talked easily, going downhill until we reached the bamboo bridge after about an hour. Great day, I <3 Lingee and the absolutely wonderful people who inhabit it! This entry was posted in Uncategorized on November 20, 2015 by thomsoep. India is a country with the diversity of a continent. The cultural differences among geographical regions is so drastic that I am wary of any statement about in “Indian Culture”…Indian people traveling to different states will be faced with language barriers, unfamiliar ways of eating unrecognizable foods, different clothes and fashion, and many more “new” experiences. Traveling within India may be a very “foreign” experience to an Indian. In the same way, traveling within the United States as a U.S. citizen can evoke feelings/awareness of alienation or cultural contrasts. Therefore, as a U.S. citizen in India, I have to be cautious tip toeing around these two large categories that are often tossed around. I have no place to speak for the United States culture (whatever that means), and by interacting with small pockets of the Indian population, I have not gained an awareness of Indian culture (whatever that means). I am attempting to keep this point at the core of this blog and encourage you, reader, whether in the U.S., U.K., India or Pluto, to refrain from thinking of any country as a single story. Pakistan is not the story of terrorism and Osama Bin Ladin, India is not the story of curry and Hinduism, the U.S. is not the story of capitalism and greed. Countries are political constructs, they are not reflective of the people living in them. HOWEVER, in order for us to understand the system of globalized politics and systems of power, these political constructs become unavoidable. So, here are some interesting statistics that may help you frame India as a political entity. According to findthedata.com, India’s population is 1.25 billion people, 50% of which are under the legal voting age (18). 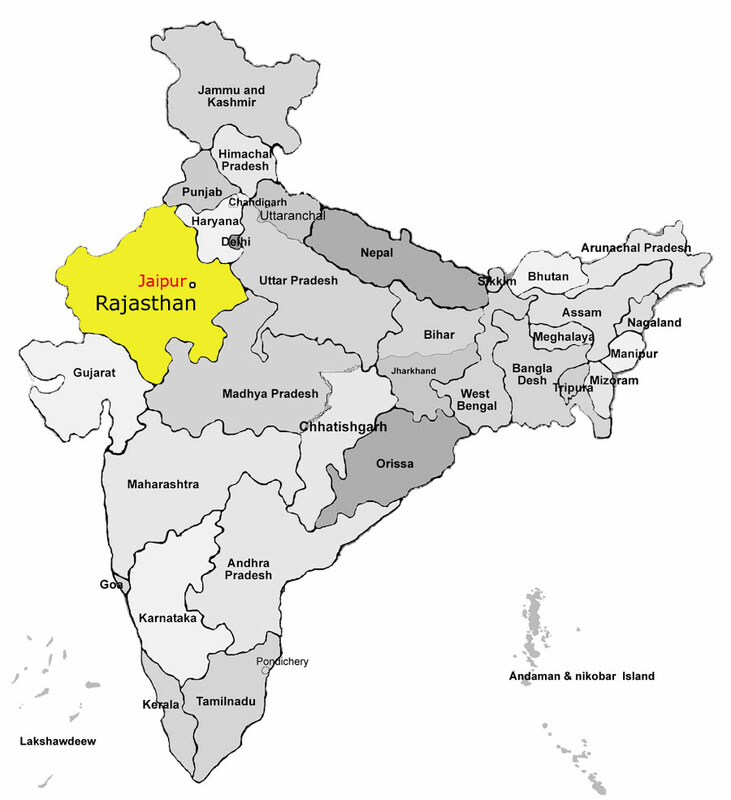 The rural population in India is 825 million and the urban population is 401 million. The U.S. has a population of 316 million. The rural population of the US is 59.2 million and the urban population is 257 million. The population density of the U.S. is 34.56 people per sq. 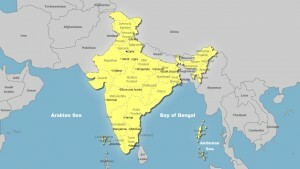 km, while the population density of India is 410.6 people per sq. km. India is 2.97 million sq km while the US is 9.16 million sq km. 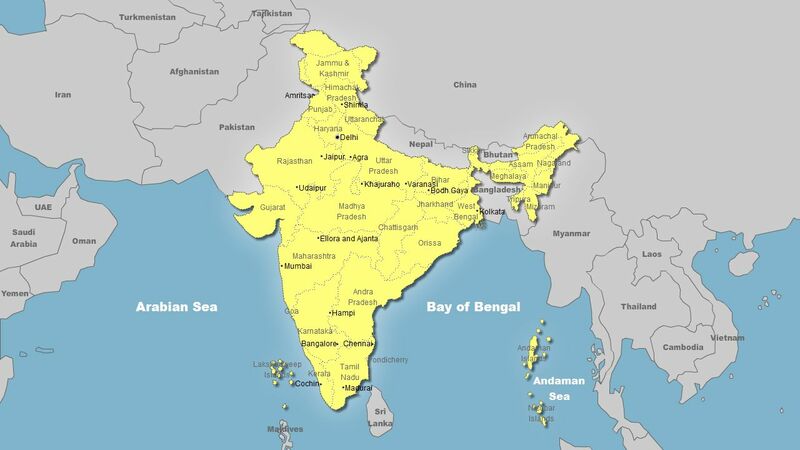 India is divided into 29 states, which are outlined in the map below. 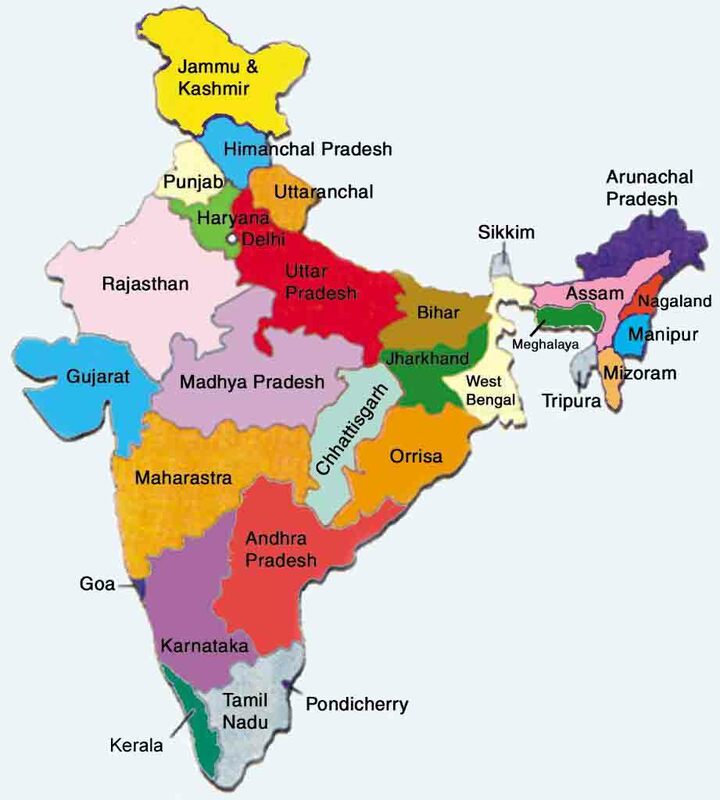 These states politically function within the Federal Republic of India in the same way states in the United States of America function in the Federal system. 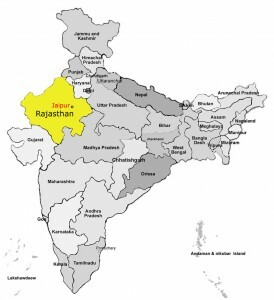 This map highlights the capitol city, Jaipur, of Rajasthan, the state in which I have spent the majority of this semester. This entry was posted in Uncategorized on October 30, 2015 by thomsoep. Ah fresh air has never felt so…fresh! Last Sunday I boarded a train with 5 classmates and two teachers, bound for the Himalayas of Himanchal Pradesh, a state in far northern India. We weren’t just headed for the mountains – oh no. Our final destination was the mystical grounds of a grassroots feminist organization, tucked within one of the ‘holiest’ cities on Earth, Dharmshala. 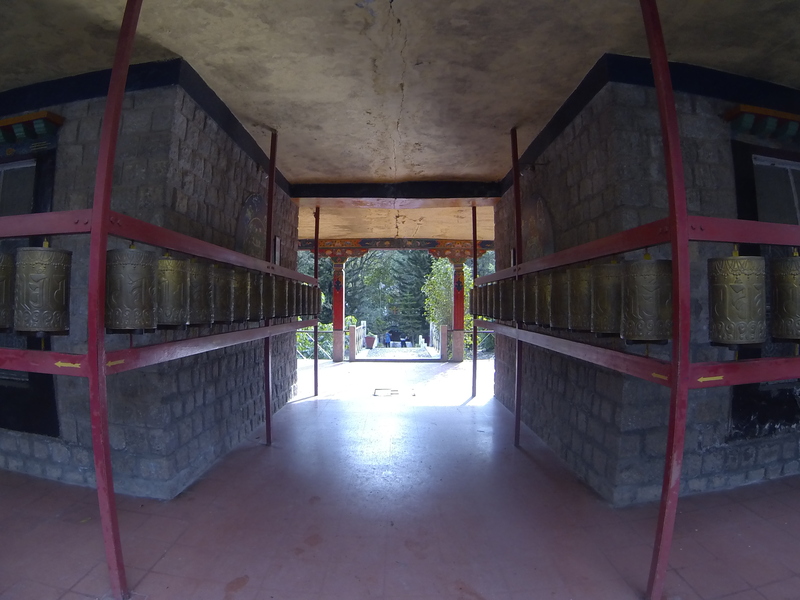 Dharmshala is the home of the Dalai Llama and Tibetan refugees. The town is a top destination for the spiritual tourists who flood to India from the West. 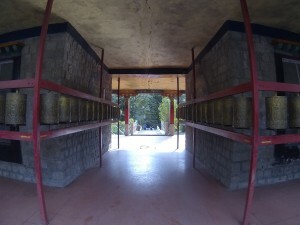 There are many Tibetan Buddhist monasteries and nunneries in Dharmshala. I had the opportunity to visit a few. As a religious studies student, I was in nirvana. I find Tibetan Buddhist philosophy to be fascinating, and the Tibetan monastic life lead by the refugees in Dharmshala posed great contrast with the Zen monastic life I experienced this summer at a monastery in Oregon. I could spend months delving further into the Buddhist community in Dharmshala, but the point of this journey was attain an understanding of Jagori, the highly esteemed rural feminist NGO. 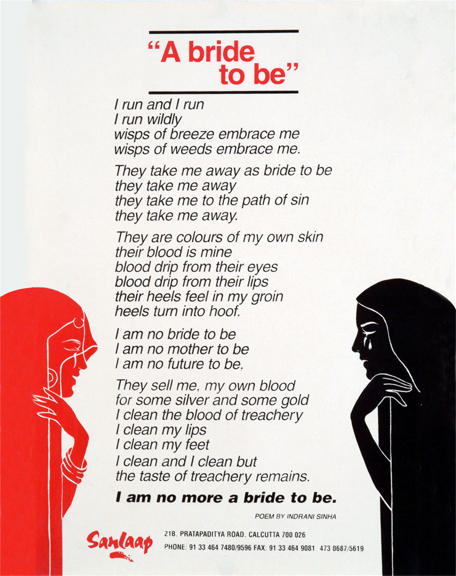 Ultimately, my week at Jagori blew my hesitancy towards feminism out of the water. I have never known how to interact with the feminism I’ve been exposed to at school and in the U.S. at large. I have what, many may consider, a radical relationship to my humanhood and the various colors that paint it “woman”. I’ve struggled with find the common ground my experience as a woman has with feminism. Jagorian feminist philosophy supports and encourages equanimity above all else. This equanimity is not restricted to gender or sexual orientation, but extends to all forms of life. 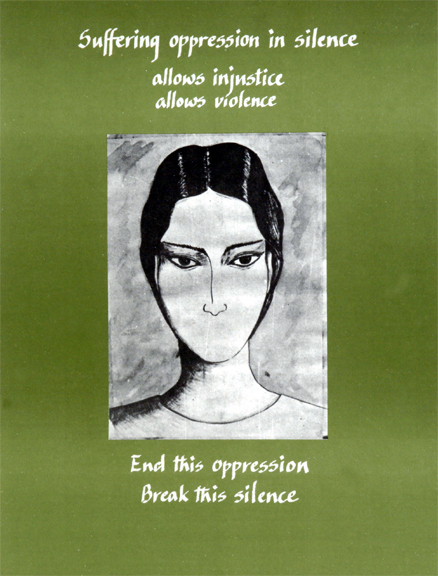 Feminism is not a concept concerning only females, but encompasses the livelihood and well being of all. 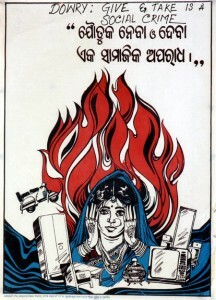 Today, women in rural India lack an autonomous voice to call attention and demand justice regarding the plethora of issues many face, including domestic violence, sexual assault, and verbal, physical, and mental abuse. All over India, but especially in rural towns, marriage is the crux of life. Women are considered a burden to families, as they are useless to the family once they turn 21 and are married off. A family will select a their child’s future husband or wife, which is known as arranged marriage. In the marriage process, the female leaves her home and moves into her husbands’ family house. Living in her in-laws’ house is not an easy adjustment. Now, the newly wedded woman must take on the burden of cooking, cleaning, and taking care of the entire family. In addition to these household demands, she must emotionally process her first sexual relationship with her husband. The transition may be extremely rough depending on nature of the in-law family. Jagori runs a woman’s court, which I had the opportunity to observe, and the case at hand blatantly illustrated just how difficult and messy marriage can be. The court was initiated 12 years ago for the benefit of all surrounding communities, bringing any issues that may lead to legal action into conversation with 8 women, the court members. The aim of the court is to help people avoid bringing problems to the corrupt legal system, which may take years to deliberate and settle a solution to any problem. The majority of cases brought to the woman’s court are successfully solved in the court. The court hearing I was at looked like this: 8 women, sitting on the floor in a half moon formation in a small room, the family whose case was being considered gathered in front of the assembly (the entire family came, sisters, brothers, grandmas, aunties, grandfathers, even the local government panchyat representative). In this case, the trouble concerned the new addition to the family. The families’ eldest son had recently married a young woman and she had been living with his family for a few months. When she moved in, it became clear to the family that she had some mental disorders. The family informed the court that this girl is mentally inept, while the young woman sat right there. The trouble was that the girls’ family never mentioned any of these mental conditions (apparently she was extremely reserved in the new house and seemed to be slow to respond or react to things) in the marriage agreement. Her in-laws had taken her to see a doctor, who prescribed her heavy psychotics (one generic drug used to treat schizophrenia) without articulating a diagnosis. This was challenging for me to digest – here this young woman sits in front of her new family who has brought her to meet these strangers, ultimately to complain about how inept she is. The trouble was, the family she was raised in would not allow her to come back home. An unmarried woman is an embarrassment and burden to a family. She was unwanted by anyone. Nothing was resolved, the family was asked to return in 2 weeks to further discuss what action they want to take. I’m haunted by the encroaching awareness that this woman has no control over her body or mind – shipped off to a new family, drugged, and now discarded. This story of woman as an object for marriage and familial labor has been pervasive in my experiences in India – I’m constantly challenged by my own “woman-ness” in these circumstances and brought to question my potential as a fellow woman to empower the victims of gender based oppression in a cultural context I am more or less alien to. the Voice of Unity originates from within the skin!